Never in my online life have I seen such a lovely invitation to customers to keep offering feedback. No anonymous “no-reply@” or off-putting “do-not-reply@.” Instead, customers see a welcoming and wonderful opposite. Please reply. Gracious and personal. When I wrote back to express how delighted I was to see it, I received a personal reply from David Kjelkerud who promptly credited Orson Kent for the idea. Readmill opened to all recently. If you haven’t yet, you must sign up. I hope you love it as much as I do. Response times: what are your expectations? Making customer service the best it can be is a part of what I do every day. I’m curious: when you write to customer support, how quickly do you expect a response? Who have you had outstanding experiences with when you’ve had to write to customer support for a piece of software or web application that you use? Upon discovering their support email address, I wrote to them with my inquiry. Right away, they set low expectations with site copy that indicates support is limited and that you can expect to hear from them within 48 hours. I received an auto-response signed by Boxbe Support, the first line of which counsels me to read all the way to the bottom of their impersonal reply. It contained a series of links to what I’d imagine are their most frequently asked questions, none of which answered my query. Reading to the bottom, the note instructs me to write to a second Boxbe support email address to actually get my query into their ticketing system. Since Boxbe touts themselves as a method to end email overload, I find it ironic that their first reply is a disappointing auto-responder sent by a robot. I wonder what percentage of queries get solved by this auto-response, which acts as a hurdle to actually getting into their customer support queue. Upon writing to the second customer support email, I received another auto response, with the same links as the first auto response. At this point, Boxbe sets customer expectations very low, as the second line says “As you know, our support is limited.” They also mention that users can expect a response within 72 hours. I did receive a reply (on the same day, which was awesome). They answered my question. I assume it was written by a human, but it was impossible to tell as it was signed by Boxbe support. One might assume that the company is run by robots. I was delighted to be a guest on The Big Web Show Episode 43 which was recorded live on March 24th. Jeffrey Zeldman, Dan Benjamin, and I talk about Polldaddy, developing voice, and my philosophy of customer service on the web. Check out The Big Web Show’s latest episodes. I lined up to buy two iPad2s on Sunday, just as the store opened around noon. About 40 people were already in line. Three Apple employees worked the line, chatting with each person to ask what they had planned to buy. They answered questions. They alleviated anxiety by letting customers know which models they had left in stock, so that people didn’t have to wait in line for 30 minutes only to find their preferred model sold out. Upon reaching the entrance, I chatted with the Apple employee managing the front of the line. He explained that a genius would guide me through my purchase, from selecting a model, to trying it out and getting it set up. A very friendly Apple gal arrived, shook my hand, introduced herself, and guided me through choosing models, covers, even offering to set up the iPad and reinstall all my apps so that I could play with the new iPad while walking home! She answered all my questions, and took the extra step to associate my purchases to my business account at the Apple store in Winnipeg. The personal touch made the difference here. Apple employees managed expectations by speaking with each customer: between waiting in line, reaching the front of the line, selection, and payment, I spoke with four different employees. Each person was friendly, knowledgeable, competent, and above all, gracious. Apple, it was a pleasure doing business with you. I’ve been a Rogers Iphone customer for nearly three years. Where I live, Rogers has been the only option for iPhone customers since the iPhone launched in Canada in August, 2008. In addition to being the exclusive provider, Rogers has the dubious distinction of offering the second most expensive iPhone contract in the world. Recently, Rogers text-spammed me on some silly offer. To opt out of future texts, I clicked on the link provided, only to arrive at an unsubscribe page lacking a mobile stylesheet. The text was impossible to read on my phone. I was unable to unsubscribe, and so now I’m doomed to receive more text spam. This story would be ironic, if it wasn’t idiotic. Yesterday, to thank me for my business, Rogers Canada e-mailed me with an offer to enter a contest to win Toronto FC tickets. Hmmm….I thought, I wonder if this includes airfare, since I live in Manitoba. Reading the fine print, I discover that the contest is open to Ontario residents only. Nice going, Rogers Canada! I replied to the offer e-mail to let them know of their faux pas. The auto-reply revealed that the mailbox is not monitored. It’s not the fact that Rogers Canada made the mistake that bothers me—although you’d think that they could have done a database query to develop a mailing list that would include Ontario residents only—what really irks me is that by choosing to ignore replies, they’re missing out on opportunities to discover such errors to prevent them from happening again. In a word: fail. Mistakes are ok. Not caring about mistakes is not ok. It’s arrogant, faceless, and evil. I tweeted my dismay, @Rogers_Canada, as I have in the past. Promptly, I get “Sorry for the inconvenience” @replies from a very nice woman who goes by the twitter handle @RogersElise, who is apparently the only human at Rogers Canada. Since apologies for the inconvenience are all she’s able to offer, I empathize with her—an employee who is essentially the public face of a corporation with no regard for its customers. At this point though, after three “I’m sorry for the inconvenience” @replies, this is becoming patronizing. Rogers Canada’s disregard for their customers is arrogant and pathetic. Thankfully, the evil dictatorship is about to end, as MTS enters the iPhone market at the end of March. My Rogers contract ends in August. With number portability, I’ll never look back. 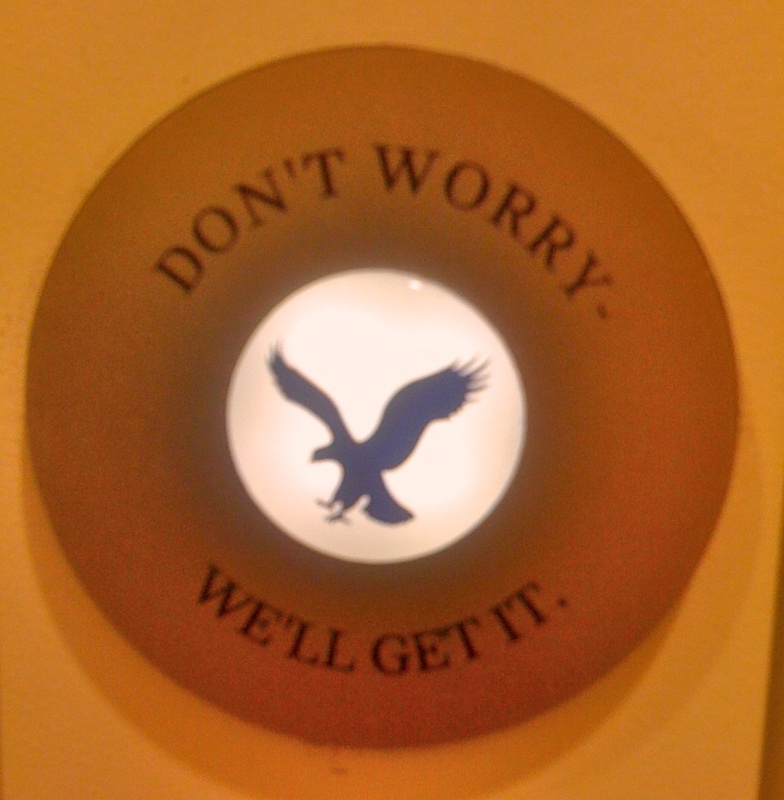 Here’s an example of how American Eagle sets themselves apart with customer service. As I went in to the fitting room to try on some clothes, the clerk pointed out the button on the right, which says Don’t worry, we’ll get it. If, while you’re trying on clothes, you decide you need a different size, just press the button. This alerts the clerk who comes to ask what size you need, then goes to retrieve it from the store. This is great—it saves the customer the hassle of putting their own clothes back on, and running around the store to find the size they need.